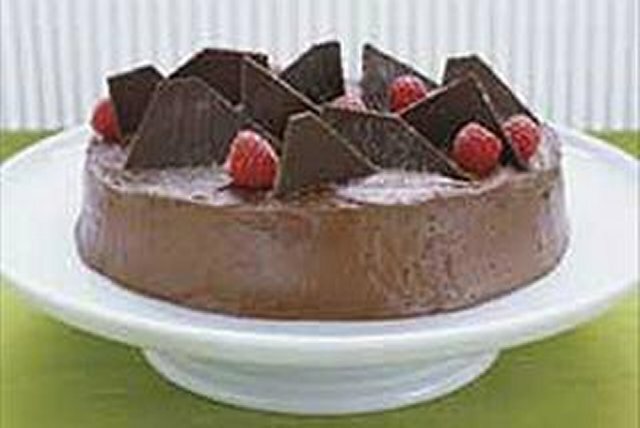 A homemade chocolate cake with a simple chocolate frosting, this Chocolate-Raspberry Torte is decadent and delicious. A secret ingredient gives it a hint of raspberry flavour! Spray 9-inch round pan with cooking spray; cover bottom with parchment paper. Microwave 4 oz. chocolate and margarine in large microwaveable bowl on MEDIUM 1-1/2 to 2 min. or until chocolate is almost melted. Stirring after 1 min. Stir until chocolate is completely melted. Add dry jelly powder and granulated sugar; mix well. Stir in eggs. Add flour; mix well. Pour into prepared pan. Bake 40 min. or until toothpick inserted in centre comes out with fudgy crumbs. (Do not overbake.) Cool cake in pan 5 min. Run small knife around edge of cake to loosen edge. Invert onto wire rack; remove parchment paper. Cool cake completely. Meanwhile, melt 4 oz. of the remaining chocolate as directed on package; spread onto parchment-covered baking sheet. Refrigerate 30 min. Microwave remaining chocolate in large microwaveable bowl as directed on package. Whisk in Cool Whip until well blended. Transfer cake to plate; frost with Cool Whip mixture. Use sharp knife to cut chocolate on baking sheet into 1-1/2- to 2-inch irregular-shaped pieces. Arrange on cake. Top with raspberries and icing sugar. A serving of this sweet treat goes a long way on chocolate flavour.